Ned Kelly moved to the Philippines in 2013. While there, he has broken his back, become an expert on tropical bacteria and survived back-to-back weeks of sweating through his t-shirt by 9 AM. Amidst these minor little tragedies, he fell into a relationship with his fiancé, Michell. 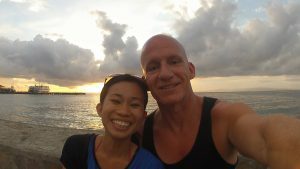 What follows is the second part of an excerpt from his e-book, Chasing Your Philippine Dream: An Expat’s Guide to the Philippines on how he and Michell met and some of the cultural challenges that ensued. Insert awkward moment of silence here. Michell acknowledged this with a nod whilst the merriment of the university students in the background continued. Brow furrowed, I chewed over what she had said. It was an odd admission. Even odder was the fact that she had confided this to me in our very first video call. Although I had been researching the Philippines for quite some time, this was the first of many “cultural things” that I was to learn about life there. “Interesting….” I trailed off, thinking that most guys I knew wouldn’t be keen on dating a virgin – having to revisit that super awkward first time wasn’t high on most folk’s priority list. Then again, most of my friends at the time were in their 30’s and 40’s…. After admitting to this apparent lack of virginity, the conversation quickly smoothed out and we chatted about pretty much everything and anything. Much like our texting, the conversation hit an easy flow and we babbled on about our families, favorite books and authors, her university classes, movies and all the like. Interspersed into our video chat was the occasional deafening roar of tricycle taxis with inadequate mufflerage, manic roosters crows and a random Filipino or Filipina peering into Michell’s monitor to check out the pale and pasty “kano” that Michell was chatting with. After about an hour or so, the call came to an end as Michell had to attend class. Following the call – and despite my generally unreliable memory – I clearly recall walking about with a big grin pasted across my mug. Michell and I video chatted regularly over the next few months. She had even put together a simple bisaya (the “mother tongue” of the Visayas) guide for me and I remember her finding my initial attempts at the local lingo rather hilarious. After time, we started to refer to our chats as “dates” and we would sometimes have dinner/breakfast (12 hour time difference) while we rambled on. At some point, I admitted to Michell that I “really, really liked her.” Again, this wasn’t something that I was specifically looking for – it was just one of those things that happened. Thankfully, this admission was well met, and she confided that she liked me as well. At that moment – in late winter of 2012, we sort of became boyfriend and girlfriend – yet another hapless couple who have never met engaged in a long distance relationship. Her Past Relationships: When Michell talked about her past significant others, I sort of just nodded my head and apparently didn’t ask enough follow up questions. This caused even more annoyance, as I wasn’t showing an appropriate level of jealousy to show how much I liked her – again, a cultural difference between the East and the West. Where Were You? : Nearly every chat would invariably involve Michell wanting to know where I’ve been and who I’d been with. This inquisitiveness is another jealousy-based cultural thing that resembles nothing more than simple nosiness to the average foreigner. Tampo: When I said (or did) something Michell didn’t like, she would instantly shut down, giving me Philippine version of ‘silent treatment.” I later learned that this was called tampo and when faced with this, an uyab (boyfriend/girlfriend) was supposed to shower the tampo partner with lambing – affectionate words, small gifts and entreaties for forgiveness. Tampo is a big thing in the Philippines, and it can be really frustrating for foreigners when they first get into relationships here. Most of the problems Michell and I experienced came as a result of my Filipino cultural ignorance – not understanding the subtle rituals of the “courting” process and saying the wrong thing at the wrong time. Sometimes, this is referred to a “hoof in mouth” disease. Beyond my ignorance of Filipino culture, a lot of these relational hiccups stemmed from Michell seeing other Filipinas getting “played” by foreigners – Western men who promise the world and then arrive in the Philippines, have their fun and flutter off to other women. In the Philippines, players such as these are referred to as “butterflies” or “chickboys.” So, in hindsight, Michell’s over reaction to certain things was based on real-life experiences. In general, things went fairly well with Michell and I. As I noted, there were some issues along the way, but they were all things that eventually got beyond – and in doing so, I’d like to think that we are both better people for it. Years later, I couldn’t be happier. Michell and I are engaged and will eventually tie the knot. We were initially planning on a big “blowout” of a wedding but after stressing over the details, Michell suggested that we simply have a civil ceremony through the mayor’s office. That suits me just fine – I have never been one for ceremony and the “big” wedding planning was stressing me out as well. Michell and I have now known each other for nearly five years. For the past three and half years, we’ve been together, living, working and enjoying our simple life here in the Philippines. Michell makes good money, I make a bit more and every month we save more than we spend. We try to travel when we can, involve ourselves in monthly charity work around the community and do what we can to make each other’s lives better for being in it. Just so you know, I was very lucky in meeting Michell. As I noted in the previous article, there are many scammers and hustlers on foreign dating sites. On top of that are all the horror stories I have personally witnessed with cheating girlfriends, stolen bank accounts, broken hearts, lost homes and the like. In my experience, though, these instances are the exception not the norm – most of the foreigners living here with their spouses or significant others are very happy. And don’t forget: You don’t have to live in the Philippines. I know a good number of folks who have brought their better halves back to their home nations on either fiance or spousal visas. This is a guest post by Ned Kelly. What’s the Longest Part of the Spousal Visa Process?